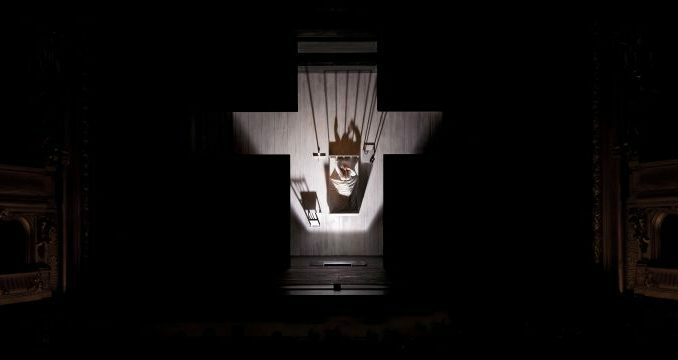 Olivier Py’s successful Paris production of Poulenc’s gripping masterpiece has made its way to the recently-reopened La Monnaie, with two different casts. 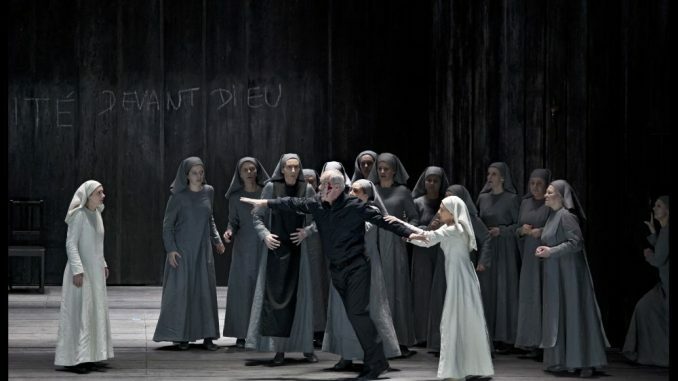 The production is sober and dark, and grippingly conveys the experiences of the nuns of Compiègne. I attended a performance of the second cast, with Belgian soprano Anne-Catherine Gillet as the tormented Blanche de la Force (rather than Patricia Petibon), Marie-Adeline Henry as Madame Lidoine (instead of Véronique Gens), Karine Deshayes as Mère Marie (rather than Sophie Koch) and Hendrickje van Kerckhove (rather than Sandrine Piau) as Soeur Constance. In terms of sheer ‘star power’, the first cast wins. Vocally and dramatically, however, the second cast nowhere felt like a second choice. Anne-Catherine Gillet proved an excellent Blanche de la Force. Her acting was very natural, and she conveyed the panicky, nervous nature of her character excellently. Often, sopranos with decidedly different-sounding voices are cast in the roles of Blanche and Soeur Constance, to mark the contrast between the light-hearted Constance and the anxious Blanche. The voices of Gillet and Van Kerckhoven, however, shared a similar youthful vocal colour and timbre, which seemed to highlight the similarities between the two novices. After all, they are of the same age and both new to life in the convent. After missing earlier scheduled performances due to illness, Sylvie Brunet-Grupposo sang the role of Madame de Croissy for the first time. Her wonderfully dark voice and expressive stage presence made for a bone-chilling performance of the tragic Mother Superior who dies in utter fear. As Mère Marie, Karine Deshayes came across as especially warm. In the wrong hands, the character of Mère Marie can come across as a rather cold, fanatic zealot. Deshayes, however, managed to make the character profoundly human. Her voice sounded consistency clear and warm at all times. Marie-Adeline Henry sang an excellent Madame Lidoine and Stanislas de Barbeyrac gave a dramatically and vocally impressive performance of Blanche’s concerned brother. The orchestra of La Monnaie, under music director Alain Altinoglu, gave a gripping account of Poulenc’s powerful music. The staging of Olivier Py was very dramatically focussed. The sets by Pierre-André Weitz were dark, but visually gripping. By means of simple-looking changes to the sets, the convent convincingly transformed into a wooded area with Madame de Croissy’s tomb, Blanche’s home and a dark prison cell. The final scene of the opera is its most gripping. In it, the nuns face their martyr’s death and are strengthened by (the illusion of) divine grace. While singing the Salve regina, the nuns are decapitated. One by one, voices disappear, until – after Blanche’s death – there is only silence. In Py’s production, the decapitated nuns turn around and, one by one, walk towards a screen with a starry night’s sky. This image is rather poetic and suggests their souls wafting off to heaven. It may not be everyone’s cup of tea, however – Robert Carsen’s production, for instance, is visually harsher and leaves things more open-ended.